I am delighted to be able to post my Bloom Day post on time this month. To view other gardens, across the world, to see what they have in flower at the moment browse the comments list on Carol’s post on May Dreams Garden . I have decided, for a change, to post a video of my flowering plants to show how they nestle amongst lots of foliage plants. For me the foliage plants are the stars of my garden at the moment and the flowers are giving spots of colour as you will see in my video below. Layanee's Northwestern Rhode Island garden . I’m delighted that, through my comments below, someone has noticed that my black grass is in flower and has asked about it – Thank-you Carol. I hoped someone would as I think this plant is rather special - here in the UK is often referred to as a black grass but it isn’t actually a grass. Its real name is rather a mouthful! Ophiopogon is actually a perennial giving this beautiful grass-like foliage all year through. It is in flower now as you can see at the end of my video above. The flowers are pretty little things but it’s the promise of what they bring that I look forward to – clusters of shiny black-purple berries! These plants can be quite expensive as they are slow growing but occasionally when I have a larger clump I will lift, divide then replant. They can also be propagated from seed when it is fresh. I tried an experiment in January when I had berries on my plants and they were beginning to fall to the ground. I gently pulled the berries off and pushed them into the soil as if they had fallen off and been covered. So far I have seen no signs that this has been successful but I will try it again – planted en masse this plant looks absolutely striking and it is a strong favourite at garden shows. 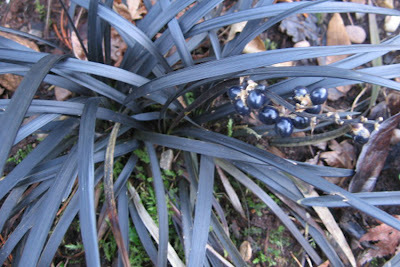 The photo above, showing berries, was taken in my garden in January 2007 and is the variety Ophiopogon planiscpus ‘Nigrescens’ (syn. Black Dragon) I bought my first plant at a Garden Open Day plant sale many years ago. The video above was taken, early morning, in my garden on August 4th 2007. Shirl: Loved your video and the garden! What a great way to show it on bloom day!. Thanks so much for visiting my RI garden! I will look forward to your future posts. What a great video of your garden in bloom. Thanks for sharing. I really enjoyed the video and music. What is that next to last flower with the dark purple grass like leaves? I want that! Thanks for participating in Garden Bloggers' Bloom Day again. I liked the video and the music too. Thanks for the compliment and linking to my blog, I am honored that you would do that. YOur video was beautiful, I thoroughly enjoyed it. I really needed the break! I particularly liked the borage, and I am enamored of the heuchera family too. Thank-you all for visiting and your kind comments. Hello, Layanee – I have been planning a video for a while now but it has been too wet or windy. I saw an opportunity and excuse so I took it! Thanks very much for your link too. Hi again, Sara – I thought it would make a nice change seeing as I have just posted many photo montages of wild flowers. Thanks again for your help with ID’s. Hi again, Carol – I hoped someone would notice the black grass! As you will read above I have just added info on it on my post. It is in my top ten foliage plants. Hi again, Robin – You are most welcome. I really enjoy looking through your photographs. Thank-you for sharing them. Hello, healingmagichands – I am glad you found it a break as that was what I hoped it would be. The borage is great dotted around the garden – it keeps coming back too. Ah, the heuchera’s. Yes they are special too – another group for my top ten foliage plants! That was lovely! Nice to see a video, to watch the breeze blowing throughout your plants. Shirl: Did I thank you for the link? If not, many thanks! My ophiopogon died this past winter. Oh well, room for something else! I loved getting a peek at your garden video-style. How creative of you! Your plants all look very healthy. You have shown us a new way to use technology in our garden blogs. Thank you. Thanks once again for visiting and all your kind comments. Hello, Salix Tree – I thought a video would be a change. It’s a while since I’ve taken one of the plants it is usually my visiting birds that I catch on film. It will be great for me to look back on the garden in the winter months. Hi again, Layanee. You are very welcome – I‘ve also added you to my list of Garden Links. I’d be optimistic that you may see your ophiopogon return to your garden. I have lost some too and they appear again a couple of years later. Hello, Marie – I thought as my foliage was stronger than flowers at the moment a video would show the flowers dotted as they actually are rather than in a photo format. I have tried to give variety in my posts and have used the video for capturing visiting birds too. I also put up a Nestbox with a camera this year which got used – sadly the chicks died as a result of changes in temperatures this spring. The parents couldn’t find enough insects. You can see that story from the label Camera Nestbox 2007. 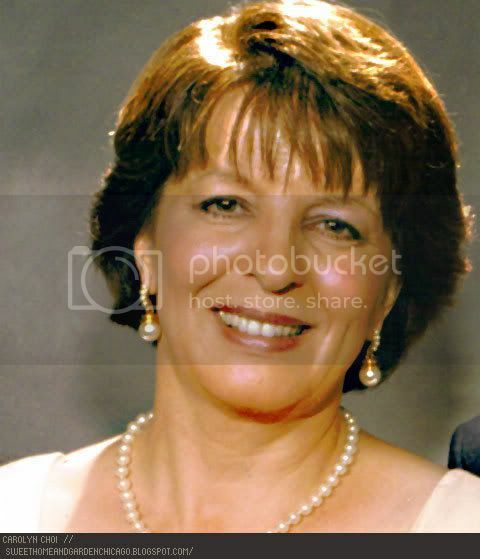 Greetings from Chicago, Shirl. I've been to your beautiful country and now I've had the pleasure of visiting your wonderful garden on Garden Bloggers' Bloom Day. It was lovely and I thank you for sharing it with the rest of the world. I'm of Scottish Irish origin myself. Please stop by my garden for a visit. What a great way to share your garden with everyone. What did I see? You were writing about the black grass I got at Branklyn Gardens this May. I saw it there near the house, felt in love at first sight, asked a gardener what was the name of this plant and where I eventually could buy it and he was so nice, took a little spade and digged out three little plants for me. I was so happy with this wonderful souvenir from Scotland. Your garden has really a very rich variety of plants. Just beautiful! Wow! Quite lovely and that last photo - what a unique shade of blue in a plant!